Ethiopian-American artist Meklit will release her new album When the People Move, the Music Moves Too on June 23rd with Six Degrees Records. The record was produced by Dan Wilson, whose previous work with artists including Adele, Taylor Swift and John Legend - as well as fronting the band Semisonic - has earned multiple Grammy awards. The album also includes Andrew Bird on violin and whistling, as well as New Orleans' Preservation Hall Jazz Band horns. 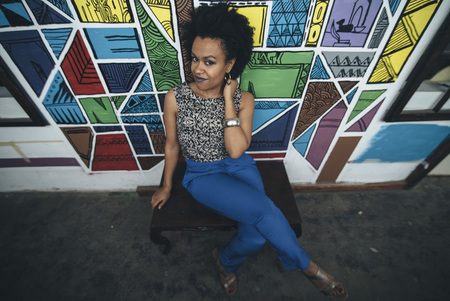 A vibrant and inspired mix of Ethio-Jazz roots along with American pop, R&B and folk influences, Meklit's upcoming record crosses both musical and generational borders to create a unified artistic vision, united behind her unique and unmistakable voice. Meklit has embodied multiplicity since she first started performing at San Francisco’s Red Poppy Art House in the mid-2000's. Born in Ethiopia, she moved with her family to Iowa at the age of two, and spent much of her adolescence in Brooklyn, soaking up the sounds of hip hop on the street. After studying political science at Yale she spent several years in Seattle before moving to San Francisco, looking to immerse herself in the city’s thriving arts scene. “I’m always thinking about America and Ethiopia, about how the hybridization is going to work in both places," she observes. The lapidary orchestrations on her new record were created by Meklit herself, with the help of her bassist Sam Bevan. But Meklit is quick to credit Dan Wilson’s lithe musical mind with a major role in shaping the ultimate sound of the record, in addition to his contribution of co-writing two songs. A prolific songwriter, arranger and producer, Wilson seemed to know exactly which player to place where to accentuate Meklit’s sound. He brought in Ethio-Cali’s tenor saxophonist Randall Fisher, who plays a perfectly calibrated Ethio-jazz intro on “You Got Me.” And Ethiopian-born, LA-based keyboardist Kibrome Birhane’s spare piano work levitates “Yesterday is a Tizita.” Meklit describes how Wilson’s songwriting precision, and razor sharp, generous feedback helped to weave a remarkable clarity into the music, enhancing Meklit’s already vivid hues. Since the release of her acclaimed 2010 debut album On A Day Like This… (Porto Franco Records), Meklit has become an international force. Both a 2009 TED Global Fellow and a 2012 Senior Fellow, you can watch her 2015 TED talk "The unexpected Beauty of Everyday Sounds" HERE. Meklit is the co-founder of both the Nile Project and the Arba Minch Collective, has been a featured voice in the UN Women theme song One Women, collaborated with musical legend Pee Wee Ellis, been commissioned to write music by Lincoln Center for the Performing Arts, served as an artist-in-residence at NYU, led multiple creative residencies in Manchester with the arts powerhouse Brighter Sound, inaugurated the UN Campaign for Gender Equality in Africa with a concert in Addis Ababa, and sits on the board board of Yerba Buena Center for the Arts.